Power Tools is a third party command line utility for Invision Power Suite developers. It aims to aid in development by packaging several useful command line script and applications together in one easy to use application. If you are on Linux, there is an optional executable included in the release package which you can extract and copy to /usr/local/bin for convenience. Tinker is one of Power Tools most.. well, powerful features! The name tinker was inspired by Laravel's own "tinker" command, and it essentially operates in the same manner. Both are powered by PsySH, an application that provides an extremely powerful PHP REPL for your applications. Stop making your life difficult by executing arbitrary code in random modules for testing, or worse yet, actually trying to use the native PHP CLI interpreter. Need to test if your Item class is working correctly? Just pop into the REPL and give it a whirl! PsySh is a truly awesome tool. To learn more about it and all the features it offers you, check it out on PsySh.org. Due to the nature of the IPS 4.x framework, several useful features of your IDE may become non-functional (suggestions, code completion, etc). This command will generate proxy classes for IPS (including 3rd-party applications), so your IDE will know how to use IPS style classes. 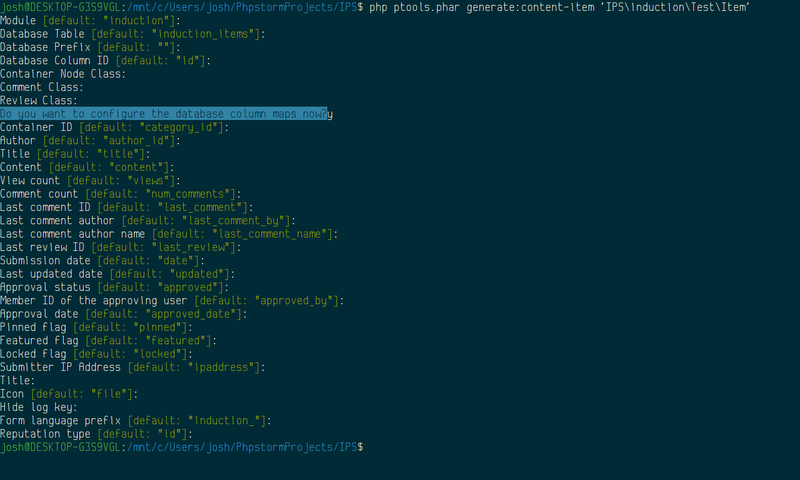 The proxy class generator can even automagically generate property mappings to all your database columns! Power Tools comes with several powerful and fully featured class generators for IPS Nodes, Items, Comments and generic Active Record classes. These generators take care of all the necessary boilerplate for you automatically. The classmap command maps unique ID numbers to your applications class files. These ID numbers are then stored and maintained for use in error codes. By maintaining and actively using a proper error code scheme, you can easily and transparently map the location of errors that are triggered in production. For more information on this feature, refer to the original Classmap script.